A charming and inviting holiday home in the Vicenza hills. 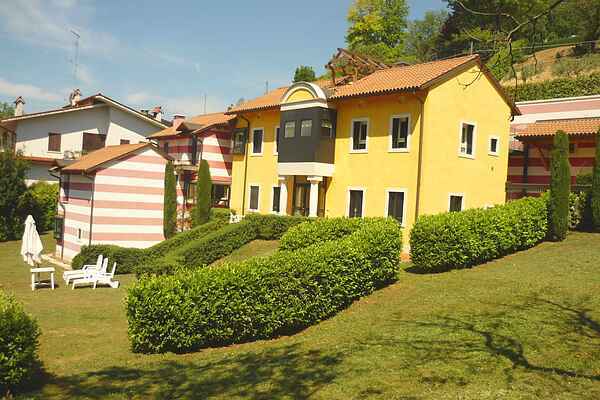 This residential complex is set among the luxuriant greenery of the Castello di Arzignano hills. This is a recent construction, although the style of the old rural homes of the Vicenza countryside has been respected. Decorations and furnishings have been selected with care, right down to the smallest detail. This complex is made up of various apartments, set across different levels. Guest can make use of a large and panoramic garden area. Ideal for a pleasant and relaxing break, that can be dedicated either to sport (golf, cycling, horse riding, etc.) or culture. The panoramic medieval square of Arzignano castle is within easy reach by foot. Only a short distance away is the Monti Lessini Regional Park and the renowned food and wine haven of Soave. An ideal position for visiting not only the surrounding area but also the entire region. The interesting surrounding area: Padua (a historical university town rich in culture, with works by Giotto), Vicenza (architecture and the Palladio villas), Venice (cultural, political and moral capital of the Veneto region, as well as a spectacular place to visit), Sottomarina, Jesolo, Caorle (sea and beach), Verona (Arena, Romeo and Juliette) and Lake Garda (beaches, surfing and amusement parks).